I've been following the 7 day cleaning rule (+/- a day or two) and was just wondering what the recommended method for cleaning is? I've been scraping away my algae with a credit card sized piece of 1/8" plexi while rinsing w/ fresh water in the sink. It removes most of the algae from the screen but leaves the algae that's inside the holes to regrow, which it does, but I don't see anywhere near the growth I see in some pictures here. I've tried just rubbing the screen with just fingers under running water but not that much algae comes off. I do get that algae growth levels are completely subjective to light and flow. Could I be cleaning too aggressively with the scraping though? How should one physically get the excess algae off the screen? Cleaning has nothing to do with how fast it grows. That requires light and flow. And lower nutrients in the water will grow faster/greener than higher nutrients. Understood. How do you physically remove the algae from your screen while cleaning though and how much of it do you remove? I'm bumping up my light and flow but at the same time I'd like to know where the "reset" point on the screen should be. A more thoroughly cleaned screen may take several days longer to get a good turf going. I had been brushing the algae off with a fingernail brush before going to scraping with the plexi as the brushing seemed to remove too much algae. With the first method of scrub-brushing at 7 days there just wasn't that much algae to remove, but by 8 or 9 days there was much more to harvest. With the scraping I think that since a bit more more algae is left on the screen to begin with, my yields are greater. The FAQ describes it as "Take the screen to your sink, and remove most of the algae while the tap water flows over it. 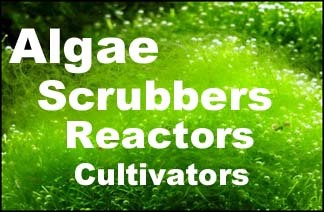 Leave some algae on the screen, so that it can still filter, and so it will grow back quickly." Some of the photos here have 3/4"+ turf that I could pull off with just my fingers. I could remove most of that but there would still be a great deal left to start regrowing. In my case I'm not sure what "remove most" means. Just use a plastic scraper, and leave some in the screen holes. I have one like it I picked up at a local reef / frag fest. Works great. Even takes off red turf pretty well and doesn't damage the screen. Once the screen is mature enough and you have growth in the holes, it doesn't need to be roughed up any more. At least, not from what I can tell, after 8 months my screen grows great and I've never had a detachment problem. Knock on acrylic. Funny, if you can believe it I actually have that thing! I thought it looked familiar. Just checked and found it in the kitchen drawer. It is pretty close to what I'm currently doing with the piece of plexi though so I'll just continue that. Thanks for the help.